Cad a Dhéanfaimid Feasta Gan Páirc Náisiúnta? Now what will we do for trees, with the last of the oaks laid low? There’s no talk of Cill Airne or its households and it’s cathedral bell will be struck no more. That dwelling where lived the generous couple most honoured but neglected by State. Overtaken by crippling species its woodlands and visitors will be seen no more. Duck’s voices nor geese do I hear there, nor the Eagle’s cry over the lakes, nor even the bees at their labour bringing honey and wax to us all. No birdsong there, sweet and delightful, as we watch the sun go down, nor cuckoo on top of the branches setting the world to rest. A stain on the boughs of CillAirne is descending neither daylight nor sun can clear. No hazel nor holly nor berry no dances or bon-fires nor wood for the violin. I call upon Hazel and Enda to send the army our way: that CillAirne, the townsland of our fathers; will rise handsome on high once more and till doom – or the deluge – returns – we’ll see our woodlands no more laid low. Now what will we do for trees, with the last of the woods laid low? There’s no talk of Kilcash or its household and its bell will be struck no more. That dwelling where lived the good lady most honored and joyous of women –earls made their way over wave there and the sweet mass once was said. Ducks’ voices nor geese do I hear there, nor the eagle’s cry over the bay, nor even the bees at their labour bringing honey and wax to us all. No birdsong there, sweet and delightful, as we watch the sun go down, nor cukoo on top of the branches settling the world to rest. A mist on the boughs is descending neither daylight nor sun can clear. A stain from the sky is descending and the waters receding away. No hazel nor holly nor berry but boulders and bear stone heaps, not a branch in our neighbourly haggard, and the game all scattered and gone. Then a climax to all our misery; the prince of the Gael is abroad oversea with that maiden of mildness who found honour in France and Spain. Her company now must lament her, who would give yellow money and white –she who’d never take land from the people but was friend to the truly poor. I call upon Mary and Jesus to send her safe home again: dances we’ll have in long circles and bon-fires and violin music; that Kilcash, the townland of our fathers; will rise handsome on high once more and till doom – or the deluge – returns – we’ll see it no more laid low. Cill Cais is a gaelic song describing the aftermath of the destruction of Ireland’s forests in the 16th century. Cad a dhéanfaimid feasta gan adhmad?Tá deireadh na gcoillte ar lár; níl trácht ar Chill Cháis ná ar a teaghlac is ní bainfear a cling go bráth. An áit úd a gcónaiodh an deighbhean fuair gradam is meidhir thar mhnáibh, bhíodh iarlaí ag tarraingt tar toinn ann is an t-aifreann binn á rá. Ní chluinim fuiaim lachan ná gé ann, ná fiolar ag éamh sois cuain, ná fiú na mbeacha chun saothair thabharfadh mil agus céir don tslua. Níl ceol binn milis na n-éan ann le hamharc an lae a dhul uainn, náan chuaichín i mbarra na ngéag ann, ós í chuirfeadh an saol chun suain. Tá ceo ag titim ar chraobha ann ná glanann le gréin ná lá, tá smúid ag titim ón spéir ann is a cuid uisce g léir ag trá. Níl coll, níl cuileann, níl caor ann, ach clocha is maolchlocháin, páirc an chomhair gan chraobh ann is d’ imigh an géim chun fáin. Anois mar bharr ar gach míghreanni, chuaigh prionsa na nGael thar sáil anonn le hainnir na míne fuair gradam sa bhFrainc is sa Spáinn. Anois tá a cuallacht á caoineadh, gheibbeadh airgead buí agus bán; s í ná tógladh sillbh na ndaoine, ach cara na bhfíorbhochtán. Aicim ar Mhuire is ar Iosa go dtaga sí arís chughainn slán, go mbeidh rincí fada ag gabháil timpeall, ceol veidhlín is tinte cnámh; go dtógtar an baile seo ár sinsear Cill Chais bhreá arís go hard, is go bráth nó go dtiocfaidh an díle ná feictear é arís ar lár. The people of Killarney have broken the world record ”Tree Hug’ in Killarney House and Gardens, Killarney National Park, on Friday 27th May 2016. The previous record was 1200 people. Today an estimated 1,977 people attended to break the world record. School Children, Locals and vistors gathered and held the 60 second tree hug. 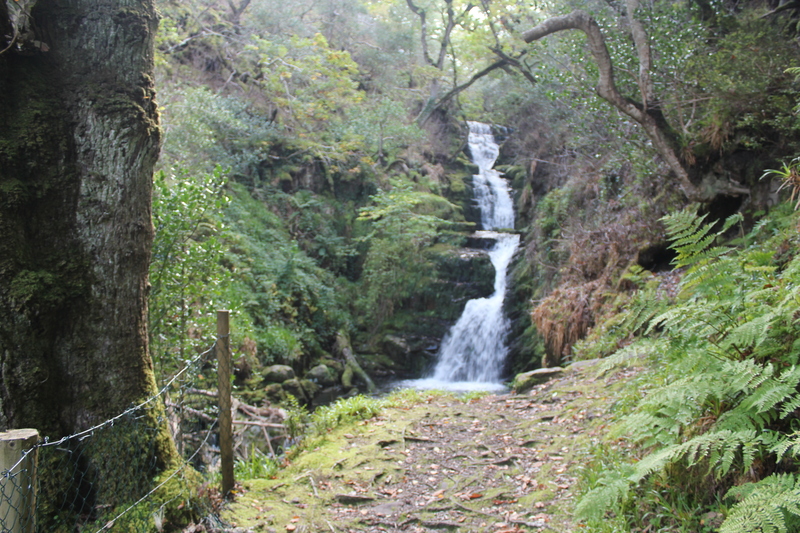 Killarney National Park encompasses 10,000 hectares of the world’s oldest Oak Forests.